NOTE: While the description below describes the effect using a seven-digit phone number, it can also be done with ten or more digits to cover area codes and country codes if required. Scott explains this in the ebook, as well some other options. You remove a deck of cards from its case. To preclude the possibility of any sleight-of-hand, you put it in a clear glass tumbler, holding it up for all to see, the face of the pack toward the audience. You begin moving cards, one at a time, from the back of the deck to the face, and seven audience members take turns saying, "Stop" wherever they choose. As each person stops you, the next card is dealt face down on the table. Everyone agrees that this procedure has been totally fair. The glass (with the deck still in it) is set aside. You pick up the packet of the seven stopped-at selections and begin to deal the cards one at a time on the table, switching the cards around as instructed by an eighth audience member. Everyone agrees that she had completely free choices and that you fairly followed her instructions exactly. For the first time, the faces of these seven cards are revealed, in the order dictated. After getting everyone to agree again that both the cards themselves and the order in which they are displayed were freely and randomly arranged at the whims of the eight audience members, you claim that you not only knew in advance this would be the outcome, but you mentally controlled them to arrive at it! The audience is understandably skeptical and demands that you provide proof of this outlandish assertion. You ask a ninth person to take out his mobile phone and dial the numbers represented by the seven cards, in order. As he dials, you say, "I hate to say I told you so, but . . ."
Your phone rings. You answer it, saying, "I TOLD YOU SO!" It is the ninth audience member on the line! 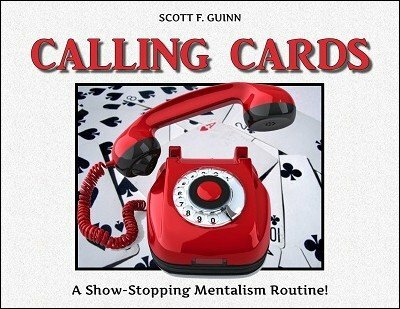 This is a stunning, show-stopping, feature mentalism routine that you can put into your act almost immediately! NO GIMMICKS. Only a regulation poker deck, an ordinary drinking glass, and your normal cell phone are used. NO FORCES on when the first seven spectators stop you or when the eighth spectator has you change the order of the cards as you deal. NO SWITCHES. You actually remove the rear card to the table each time the first seven spectators say stop, and you really follow the eighth spectator's instruction in the mixing. NO STOOGES. The participants can be absolute strangers, who exercise their free will in making their choices. You can even have the host choose them and decide who does what. NO TRICKY APPS OR ELECTRONICS. The phone call is genuine. The ninth spectator actually dials the number as the cards dictate, your phone really rings, and you really connect to his actual call. NO SLEIGHT-OF-HAND. This routine uses a couple of simple but ingenious swindles to accomplish the effect. The effect is more direct. The selection of the cards moves briskly, and the pile is dealt only once for the mixing (as there are only seven cards--or ten, if you need to use the area code - in the pile, that goes VERY quickly). Then the call is made. There is far greater audience involvement. Nine spectators assist, rather than just one or two, so you not only have more audience participation, but the possibility of stooges is completely eliminated. Because the deck is isolated in the glass, there is no suspicion of sleight-of-hand (and there really is no sleight-of hand). There is nothing in the process that a spectator can do to sabotage the outcome, such as intentionally removing or switching cards, or accidentally dropping them. 1st edition 2016, 32 pages. This work is quality produced clear photos straight to the point and love the personal side of the author who is very much in love with his faith, wife, and child. I only have his close up cups and balls until now maybe I should invest more and you too.